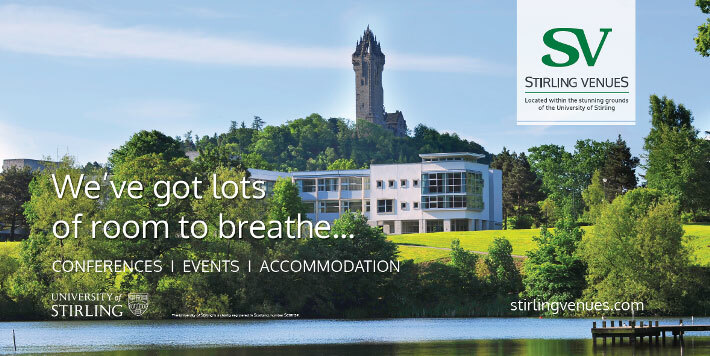 The University of Stirling has today launched a new stand-alone commercial brand to maximise income from its multi-million pound conference and accommodation business for reinvestment in the student experience. Stirling Venues provides a unique range of events management and holiday services using the University's extensive 330-acre property portfolio. Set at the foot of the Ochil Hills, it is the largest single-site provider of conference, events and accommodation facilities in Scotland. An enterprise of the University, Stirling Venues is led by Liam Spillane, Director of the University’s Accommodation and Commercial Services Directorate, which has generated more than £14.5 million in revenue since a refocus of activity in 2014. The launch of Stirling Venues follows the successful rebrand of the former Stirling Management Centre to Stirling Court Hotel last November. Liam said: “I am delighted that we have launched our new Stirling Venues brand and website stirlingvenues.com. This is the next step in consolidating and refocusing our commercial efforts at the University of Stirling to maximise our potential with existing customers and reach new markets. “I am passionate about our commitment to reinvesting our profits in the University of Stirling to ensure an exceptional student experience for this and future generations. Visit the website: Stirling Venues. Photographs are available upon request and Liam Spillane is available for further comment. Access to the facilities of Scotland’s University of Sporting Excellence, including an Olympic sized swimming pool, tennis centre, nine hole golf course and fitness suite.